This nighttime reception at the Long Beach Museum of Art included the bouquet toss as one of the traditions that the couple observed. I used off-camera flash and careful composition in order to capture the bouquet in midflight as you see here in this wedding photograph. 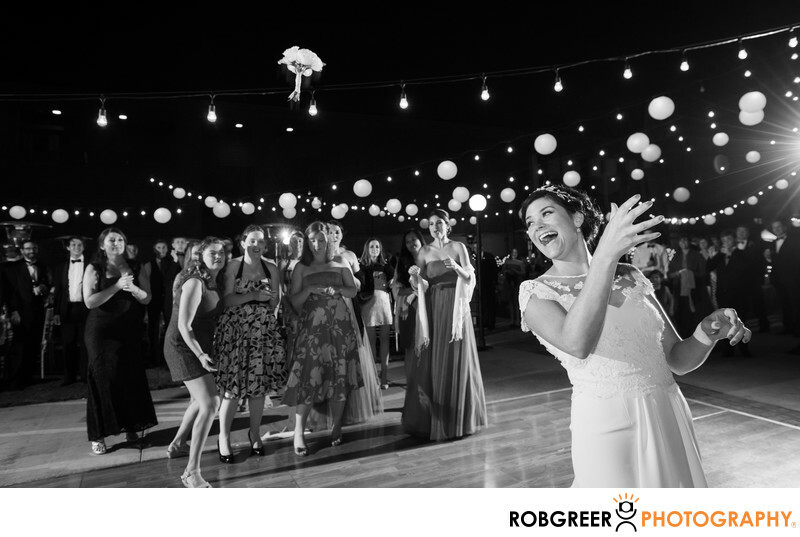 When photographing a bouquet toss, the key is to anticipate the exact moment when the bride will throw the bouquet and way just a split-second more in order to capture it midflight. One thing that I enjoy about bouquet toss photographs is the expression and behavior of the women who are positioned to capture the bouquet. As you can see here, one of the bridesmaids appears almost disinterested in the process while others appear quite hopeful. I'm also particularly drawn to the bride's expression in this photograph which is one of complete joy and happiness. Long Beach Museum of Art is located in Long Beach, California. Phone: (562) 439-2119. Website: http://lbma.org/. 1/60; f/5.0; ISO 2500; 24.0 mm.